﻿ 3 #GivingTuesday Emails Guaranteed to Get You Gifts » Red Mango Marketing! #GivingTuesday is right on the heels of major retail holidays like Black Friday, Small Business Saturday, and Cyber Monday. It’s the perfect time for your supporters to take a break from the hustle of holiday shopping and embrace the spirit of giving. How can your organization get gifts this #GivingTuesday? Send a timely email to remind your supporters how much their gifts matter to you. No matter how busy your organization is, you can send a professional looking email to your supporters in a matter of minutes. 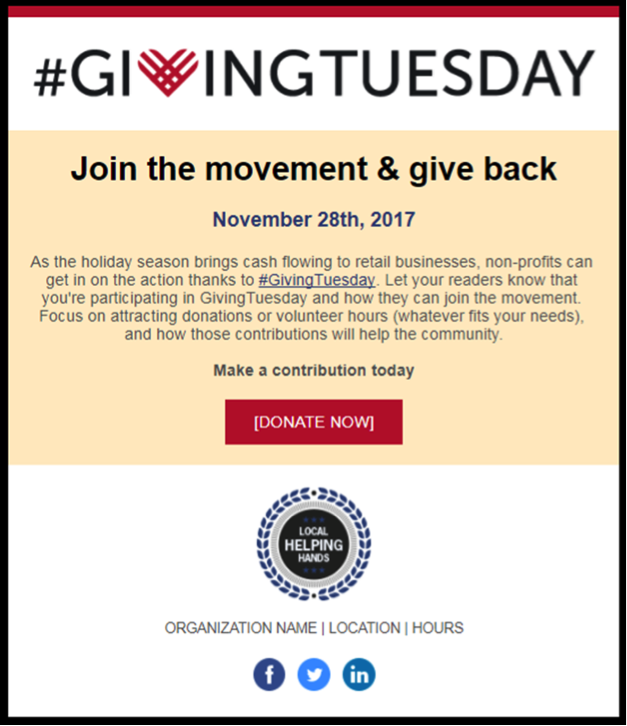 Email providers, like Constant Contact, make it easy with custom-made #GivingTuesday templates. Want to make sure your message makes an impact? Let’s take a look at some successful email appeals from other organizations. Things move fast in the inbox. You only have a few quick seconds to get people’s attention. That’s why the Wellesley Education Foundation makes their message pop with a large red banner and clear headline right at the top of their email. When writing your #GivingTuesday email, make sure to include a powerful headline like this right at the start of your message. Now it’s time to explain why donations really matter to your organization. With so many organizations out there, why should people donate to you? Get specific here and tell a story that pulls at heartstrings. The Pajama Program does an excellent job showing supporters how their donations make real, life-changing impact. Think about what story your organization can tell. Strengthen your message with relevant pictures and quotes to make your message authentic and hard to ignore. Once someone has decided to donate to your organization, it’s time for you to roll out the red carpet and give them an incredibly positive experience. 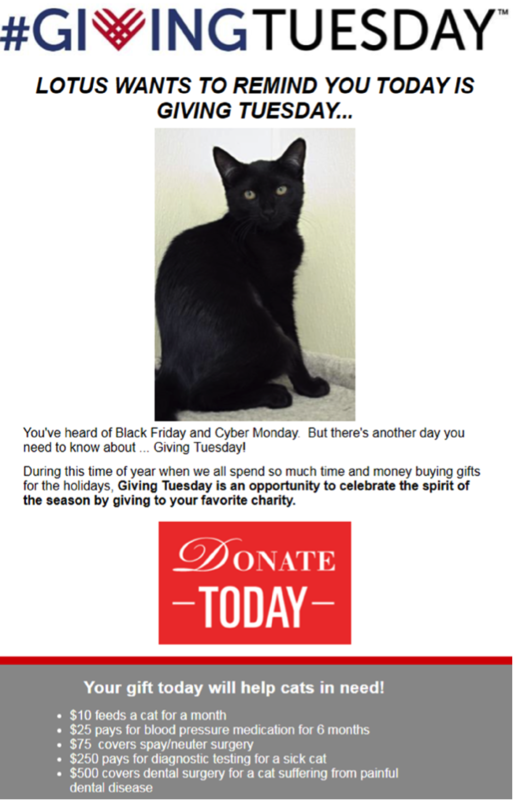 Notice how Gifford Cat Shelter draws attention to their call to action with a bright red “Donate Today” button. They also help donors decide how much to contribute by showing what specific dollar amounts are able to finance. After clicking on your call to action button, donors should be taken directly to a mobile-responsive landing page where they can make a donation quickly and easily. With these tips, you have everything you need for your best #GivingTuesday yet! Start planning early and create a compelling email that gets you the gifts your organization needs. Start today using Constant Contact’s #GivingTuesday template! 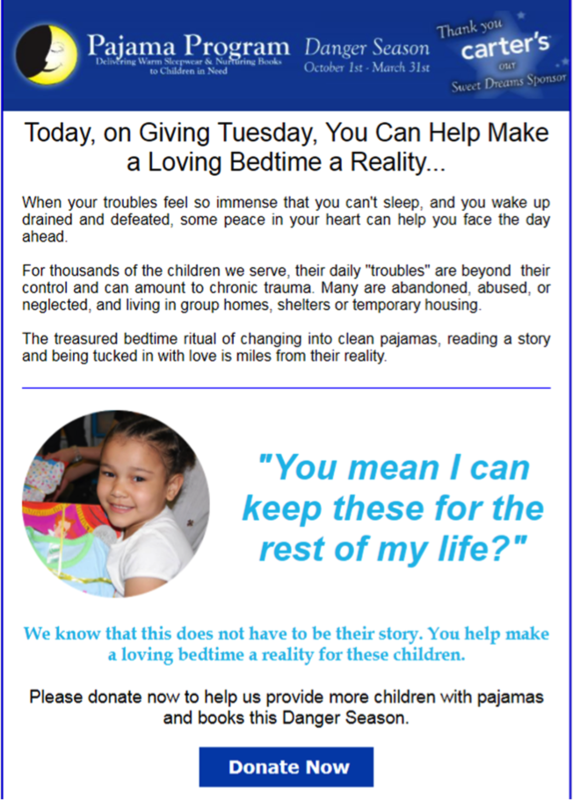 The post 3 #GivingTuesday Emails Guaranteed to Get You Gifts appeared first on Constant Contact Blogs. This entry was posted on Friday, October 27th, 2017 at 8:00 am	and is filed under Email Marketing, News & Updates, Online Marketing. You can follow any responses to this entry through the RSS 2.0 feed. Both comments and pings are currently closed.